Stunning limestone peaks, sculpted by ice creating a landscape of amazing natural beauty. Full board accommodation in mountain huts whilst on trek, 5 lunches, 2 nights in hotel at the start of the holiday, detailed walking notes and maps. This self guided walking holiday in the beautiful Vanoise National Park of the French Alps is a trekking tour which circles the Glaciers de la Vanoise - hence its other name "Tour des Glaciers de la Vanoise. This walking tour start and finishes at Pralognan. The tour of the Vanoise is a circular trek which allows you to be at close quarters with elegant high mountain peaks and stunning alpine glaciers. Less frequented than the Mont Blanc range, this stunning alpine region in the Savoie (Savoy) known as the Vanoise offers a quieter but no less spectacular alternative. Designated a National Park, the Vanoise offers an ideal natural, unspoilt wilderness for walking and trekking holidays where souring alpine peaks with pristine glaciers rise majestically above wild, remote valleys. The Vanoise National Park is home to a great many alpine peaks over 3400m including a few that rise above the Vanoise glacier, the largest glacial plateau in western Europe. Your week's trekking takes you past some outstanding mountain scenery, including the sheer Aguille de Vanoise, the Grande Casse, and La Dent Parrachée. The highest point of this part of the Alps is the resplendent Grande Casse which sits at the head of the valley from Pralognan, a traditional alpine village, unspoilt by modern development. It’s an amazing location surrounded by immense rock walls which glow pink in the evening sun. Don’t forget your binoculars, as there are a host of protected species including the famous alpine bouquetin (ibex), chamoix, bearded vulture and the golden eagle. Among the nationally protected plants in the Vanoise National Park are about ten species of androsace, the Alpine aquilegia, different sedges, Alpine Bells, Queen of the Alps, various mountain primroses and the last French stronghold of the twinflower. More information on the wildlife in the Vanoise mountains. Your day's walking on this independent trekking holiday average between 500m to 1000m of ascent and about 6 hours of walking. The difficulty of this holiday is increased due to carrying your own gear, which is why it is graded challenging+. The distances on some of the days are quite short meaning that, if conditions are good, then you will have time once you reach the hut to undertake some additional walks up to lakes, glaciers etc without your rucksack. We will supply you with a kit list to ensure that you carry the bare minimum. The holiday is ideal for those with some mountain walking experience, and would suit both those looking for a first alpine holiday, as well as those more experienced. You should be reasonably fit before you start the trek. The paths are generally good although they are mountainous in nature and sometimes exposed. They cross rocky ground and streams where you will need to be sure-footed. Early in the season you may encounter snow fields when crossing some of the higher cols. The itinerary is detailed from Pralognan la Vanoise but it is also possible to book the tour starting from the Refuge Orgere above Modane. Please contact us if you would like more details. Travel to Pralognan en Vanoise. Night in hotel. In Pralognan la Vanoise you'll be staying in a comfortable 2 star hotel or equivalent. Whilst on trek you'll be staying overnight in high mountain refuges or huts. They provide basic accommodation, sleeping in dormitory style rooms. The rooms vary in size from just a few people up to 50. Blankets are provided (so you don't need to bring sleeping bags). Meals are taken in a large dining room where a great atmosphere prevails as walkers and mountaineers share their stories and experiences. An example of one of the mountain huts is listed below. More information on mountain huts can be found on our dedicated page. There are scheduled flights to Geneva, Turin, Lyon, Chambery and Grenoble. Lyon, Geneva and Turin have the most regular services. The airlines Easy jet, Flybe and British Airways have scheduled flights from the UK - Luton, Birmingham, Gatwick, Edinburgh and Heathrow - to Lyon St Exupery airport. All have rail links with Modane and Moutiers via Chambery. There are bus services running from Moutiers to Pralognan la Vanoise. You will need to take a taxi from Modane to near the refuge Orgere if you wish to start the tour in the south. Eurostar and the TGV provide a relaxing journey from London to Lyon Part Dieu direct and changing at Lille or Paris. Local services then run to Modane or Moutiers via Chambery. Please use Rail Europe's train finder in our travel store to organise your train journey. There are bus services running from Moutiers to Pralognan la Vanoise. 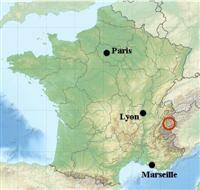 You will need to take a taxi from Modane to near the refuge Orgere if you wish to start the tour in the south. 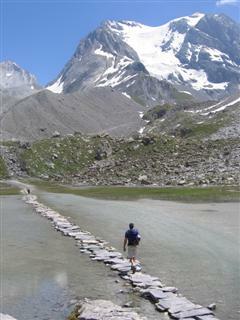 Once in France, the journey from Calais to the Vanoise area takes about 9 hours (excluding long breaks). Tolls amount to about 45 euros each way. Free parking is available in Pralognan and near the refuge Orgere above Modane. More information can be provided at the time of booking and we would be happy to help you make your travel arrangements.